When women come together, incredible things happen! 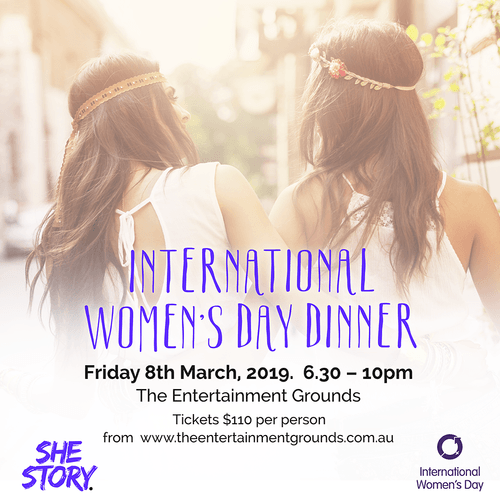 This International Women’s Day, share dinner and more…with She Story. Hear from Jo Hurley…professional speaker, business adviser and entrepreneur and our guest panel including Kate Broadhurst (Central Coast Citizen of the Year), Sam Woods (VibrantConcepts Stylist and Author), Bec Woods (Pro Surfer) and more. Enjoy drink on arrival, grazing tables, Flower Crown Making, Glam Your Glass workshop, lash and lip bar, wellness session, live entertainment and of course dancing! Grab someone you inspire or aspire to be and get your tickets. #genShe Tickets on sale now. All welcome. In celebration of our event partners we also encourage you to #dressupitfeelsgood and you could win a $500 Style Prize Pack thanks to VibrantConcepts.